The Regata Copa México Edición Olímpica will begin with the J/24 competitions, which will take place on March 2 – 9. In Riviera Nayarit, luxury means living a week full of adrenaline and speed. The J/24 competitions that will take place on March 2 – 9 in our destination as part of the Regata Copa México Edición Olímpica will create a real Nautical Extravaganza in our destination. The J/24 is the most popular sailing class in the world, and will make Riviera Nayarit vibrate when some of the fastest vessels in the world assemble here to race. 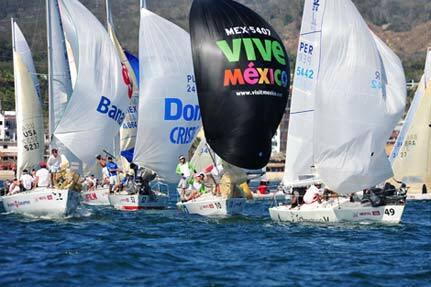 All competitions will begin at Marina Riviera Nayarit, located in La Cruz de Huanacaxtle, which is hosting this competition. The J/24 class has rapidly extended in the preferences of sailors, as it can be used both as a high endurance vessel for competitions, or for recreational activities. In fact, the class was born when Rodney Johnstone and his brother Rob decided to design a ship that would allow them to navigate with their family, and would also allow them to remain competitive. There are currently 5,300 J/24s, in 150 fleets in more than 40 countries, with 50,000 people navigating them. Experts consider Riviera Nayarit as one of the best destinations for sports sailing and for a number of nautical sports, as they can be enjoyed year-round. Additionally, our destination offers modern marinas, fiberglass specialists, and technicians that can fix all the gadgets found on a ship, as well as extraordinary touristic services.